Chocolate Chip Cookie Dough Bites are just what the Dr. ordered. Just kidding, but if I was a Dr., I would prescribe edible egg-free cookie dough bites to my clients. 😉 I am pretty sure that they will make everyone feel better. Yep, that is right and since my back has been giving me a little bit of trouble lately, that is just what I did, made up a batch of these! I don’t know of anyone that doesn’t like cookie dough. But we have all heard how raw cookie dough is not safe to eat. For many years we have heard about the possibility of salmonella in raw eggs, but over the past few years there has also been talk of the possibility of e.coli in raw flour. So in order to take away those two elements, and make cookie dough edible and safer to eat, we have removed the eggs and baked the flour. Yes baking the flour first does take more time, but it heats it to a temperature where e.coli can’t survive. The result is these fabulous Chocolate Chip Cookie Dough Bites. I remember when I went to Mexico with my neighbor, she goes down there to the Dr., he suggested that when you buy mixed nuts, you take them and put them on a baking sheet for 20 minutes @200 degrees, to get rid of any bugs. So sorry to gross you out, but it is what it is. This is the same idea with the flour. One other thing that I might suggest is that you make whatever size of bites you like. 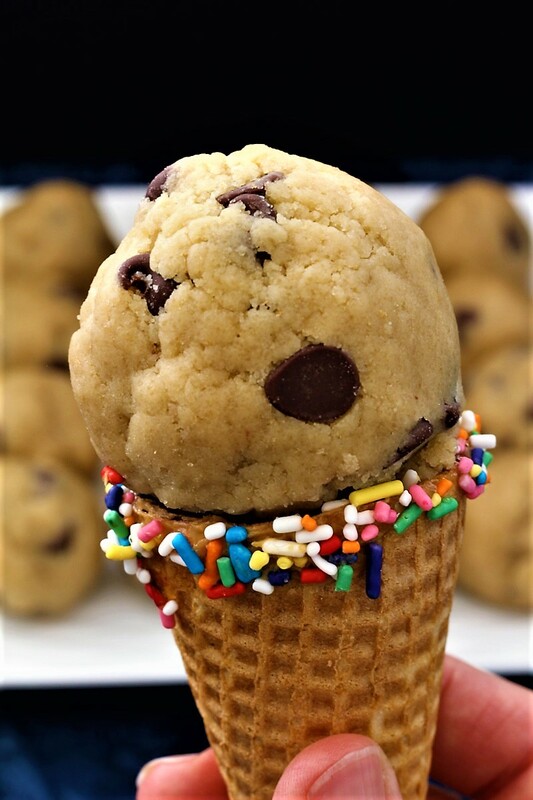 Some of the people in my house said that they liked the 1″ chocolate chip cookie dough bites and others said that they liked the cone, some like the 2″ and some said that they needed to be 1/2″ size. That isn’t worth the effort! If you have all made cookies before, it is like the first batch is 1″ size cookies the next batch is 2″ cookies and by the time you get to the last batch they are the size of an ice cream cone. Ha ha, that is because you don’t want to stand there any more and roll out any more cookie balls. Better yet, you forget the last batch and just eat the rest of the dough. 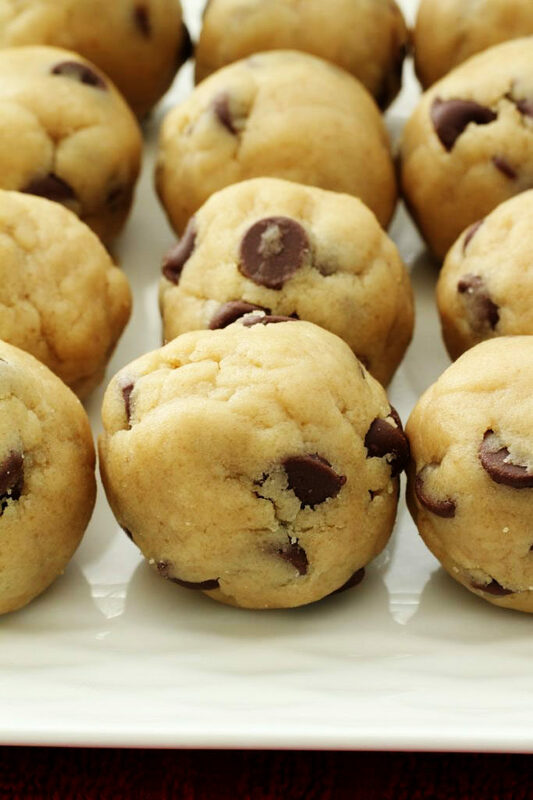 Well it is safe to say that with these chocolate chip cookie dough bites, you are safe to eat the dough. Oh, and let me just clarify that the person that thinks the chocolate chip cookie dough bites should be 1/2″, is the person who stayed home and helped his mother bake 3 different kinds of cookies one day. Mother had to run an errand and when she got home, someone was sick from testing all the cookie dough. I am sure that it wasn’t funny then, but I laugh every time I am reminded of this story. And guess what, I am not the mother of this story. It was my sweet mother-in-law, and the cookie dough tester was her son, my cute husband. I must say that my mother-in-law was an amazing cook, and we sure do miss her. My husband gets after us every time that we eat raw cookie dough and so if we make this, we are safe and he cannot really say anything. Make sure that you keep them in the refrigerator in an air tight container. Yes, they do get a little bit hard after being in the fridge and that is because butter does go hard in the fridge and these do have butter in them. But they still taste amazing. 1- Mix the butter and the sugars on high for at least 3 minutes. 2- Using part white sugar and part brown sugar makes the cookies a lot more flavorful. 3- After adding the flour, make sure that you do not over mix the dough or it will be drier. Mix just until it is combined. 4- Roll the chocolate chip cookie dough bites in your hand, after you measure them with a cookie scoop or two spoons, so that they are they same size. 5- Use your favorite kind of chocolate chips and you can even add nuts if you like. 6- Store the remaining dough in an air tight container in the refrigerator. Sprinkle the flour evenly onto a baking sheet. Bake in preheated oven 10 - 12 minutes, then remove and let cool completely. This gets rid of any e-coli. In a medium bowl, mix the butter and sugars. Mix on high for 3 - 5 minutes or until nice and fluffy. Next add the vanilla, and then the cream, or ½ and ½, or milk. Add the flour that you cooked, and the salt. Then add the chocolate chips. The dough will be crumbly looking, and that is the way it is suppose to look. Using a 1" or 2" cookie scoop, scoop the cookie dough then blend it together with your hand, then roll it into a nice shaped ball. Repeat until the dough is all rolled into balls. 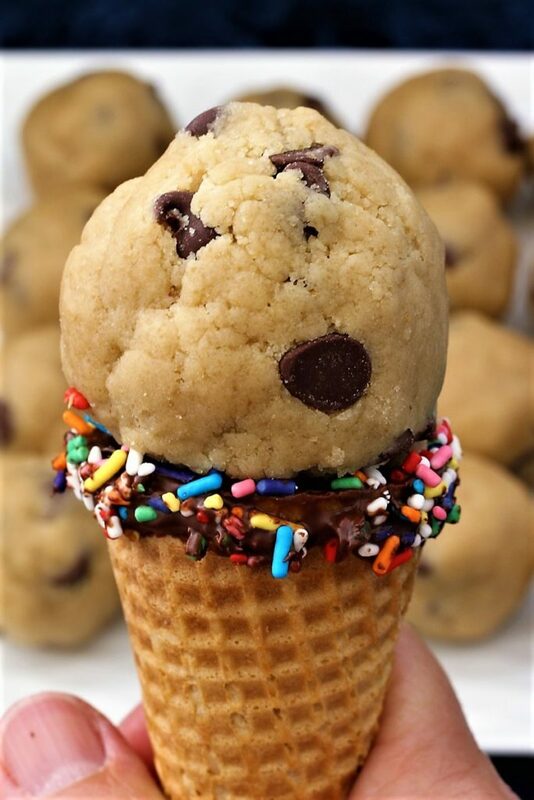 If you like, you can use a ice cream scoop and make the dough into a cone. Store any extra bites in an air tight container in the refrigerator. Oh my gosh, my kids would LOVE these! Thanks for sharing on To Grandma’s House We Go! Thank you – they are really fun. I have always loved cookie dough and I feel much safer eating these. Thank you for coming by and leaving a comment. 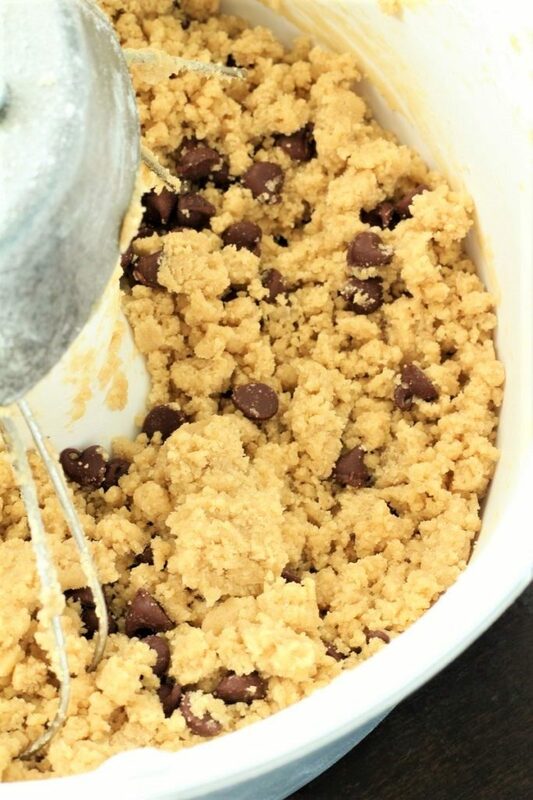 Cookie dough is one of the best parts about making cookies. This makes it the end goal which I love! Yum! You’ve got that right. Finally a safer way to eat cookies the way I’ve always loved them!!! Thanks for your continued support. Yes, I think that they turned out really fun. Thank you for coming by and leaving a comment. I’m with you on that. My dad was a very quiet man, but he always got a spoon and ate a spoonful of cookie dough when he happened to be in the house when we made cookies. I liked it because I knew that it made him happy. Thank you for your comment. Thank you. They really are cute and fun. We appreciate you coming by and leaving a comment.